Spring is approaching, which is the perfect time to think about going green this year in celebration of the highly popular season. And as much as we are advocates of the sustainability movement, today we are speaking about the color itself, offering some ideas and tips on how to give your home or office a visual facelift with the often underutilized shade. Homeowners, business owners and decorators occasionally overlook the use of green when designing an area, never realizing how much it can contribute powerfully to the ambiance of a room. Whether upgrading a living room, dining area or workspace, green’s vibrancy offers a fresh, naturally balanced approach to the standard fare typically found in design. In fact, there’s a reason the color is so often integrated into Oriental and Persian rugs themselves, as it speaks to the beautiful landscapes bordering many cities where these fine articles are woven, and effectively brings these landscapes indoors, evoking a nuanced tranquility not found in other shades. While not everyone can commit themselves to taking such a bold step in decorating, shaking things up with a true green carpet, no matter what tone you select, is a great way to spruce up an interior. 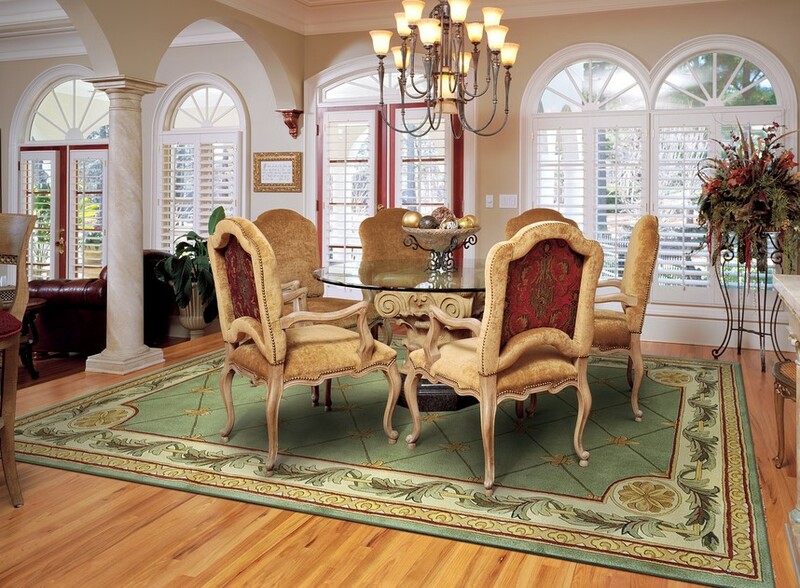 Also, one benefit of choosing a carpet such as the one seen here is its ability to mesh well with other green décor, either highlighting its dark or light qualities through complementary furniture and accessories, or drawing further attention to the rug itself with white hues or natural woods. Green can be a refreshing and rejuvenating addition to your home or living space, particularly when it is paired with other harmonizing colors. As you can see, the above rug is ideally suited for both white and cream accents and furniture, and also makes a robust statement other colors will have a difficult time competing with. Overall, it lends an airy, outdoorsy character that will cooperate flawlessly with traditional or contemporary décor. For those who might balk at the idea of adding green to their interior, a shot of blue-green in a classically designed work or living space has the potential to make the area both sophisticated and demure. Many Oriental rugs feature this kind of coloring, largely speaking to collectors in the West who prefer more understated shades. An added benefit of this particular carpet is the amount of other colors available in the finely woven threadwork, giving you plenty of opportunities to decorate your home or office accordingly. Ahdoot offers a wide selection of Oriental and Persian rugs perfectly fitting to your home or office, whether you want to simply insert a touch of green or bravely add to your décor. Be sure to browse our inventory or visit our showroom to see how we can help you design your perfect interior. We also offer organic rug cleaning services as well as Oriental rug repair to help our clients get the most out of their carpet. Happy decorating! What Does Your Oriental Rug Say About You?